The S&P 500 Index rose roughly 8% in January, the best start to a year since 1987. Despite the magnitude of the rally, the S&P 500 Energy Sector has outperformed by more than 5%. In an environment in which the dollar is contained and crude steadier, energy stocks still look to be a bargain. The S&P 500 Index rose roughly 8% in January, the best start to a year since 1987. Despite the magnitude of the rally, the S&P 500 Energy Sector has outperformed by more than 5%. As impressive as the gains have been, January's rally still leaves the sector below where it started December. The energy sector closed January at 1.7 times price-to-book (P/B) value. While this is roughly 10% above December's multi-decade low, current valuations are still below the depressed levels witnessed in November and in the bottom 10% of historical observations. 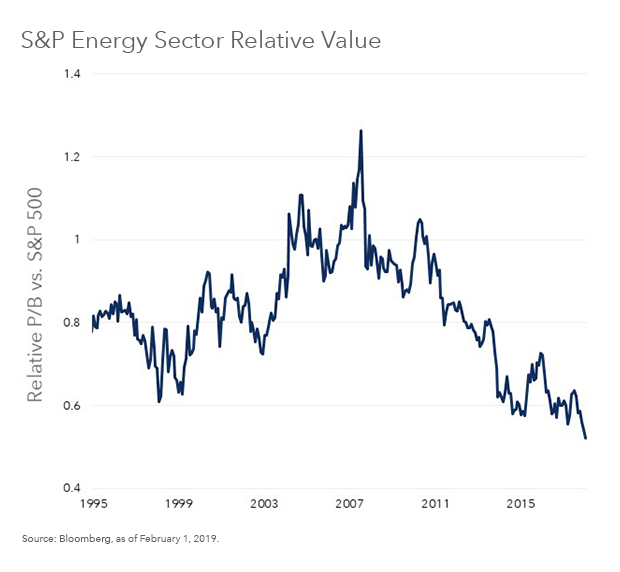 On a relative basis, U.S. energy companies continue to trade at the largest discount to the broader market since at least 1995. The P/B on the sector is about 50% of the broader market's (see Chart 1). One potential explanation for the magnitude of the recent discount: the dollar. A stronger dollar has historically been associated with lower relative valuations. Since 1995, the relative P/B of the energy sector has been approximately 10% higher when the Dollar Index (DXY) is lower year over year versus times when the dollar is higher. This relationship is arguably a function of several factors. A weaker dollar is supportive of commodity prices, which are generally denominated in dollars, as well as representing a de facto monetary easing. Given the dollar's rally last spring, the entire second half of 2018 proved a difficult period for both the commodity and stocks. That said, absent a renewed rally that regime is set to change. The dollar is trading at roughly the level it did when it peaked last May. With the Fed suddenly looking much more dovish, there are fewer catalysts for another surge in the dollar. In an environment in which the dollar is contained and crude steadier, energy stocks still look to be a bargain.